Two issues into the 'Fresh Start' for Thor hasn't felt all that fresh. Our story so far has been drowning in exposition, and requires a lot of back knowledge of the previous Thor runs to really be fully invested into, even then there has been just something that feels a little off. Coming into issue three I was hoping it would finally all come together into an issue that captured the classic magic Aaron usually brings to the table during his long run on this book. Do I get what I want? Let's check it out. Our issue begins by basically giving away one of the main surprises to this issue, the wedding, which it then goes on and explains to us in detail after the fact, and to be honest this didn't really work out for me too well. The reveal of Hela's wedding to Balder happening at the beginning of the story takes away a large majority of the suspense you're supposed to feel as you read through the issue. 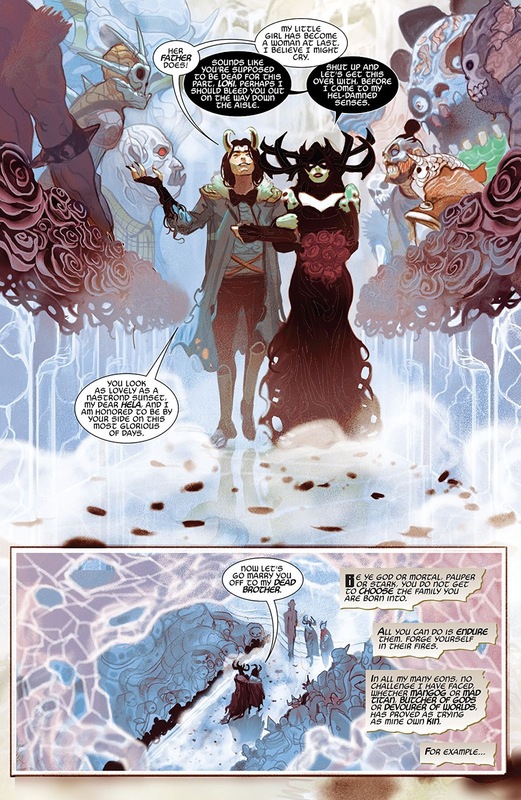 In the end, it makes it feel like a waste of time and dragged out to boot, but ultimately it's done to unite the two sides against the Queen Sindr and her fire goblins. 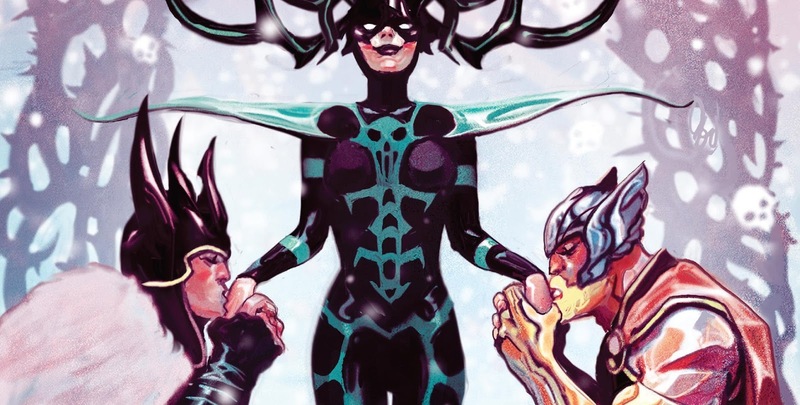 The issue isn't a total waste of time through its just comes after a truce is reached between Hela's side and the people in Balder/Thor's group. 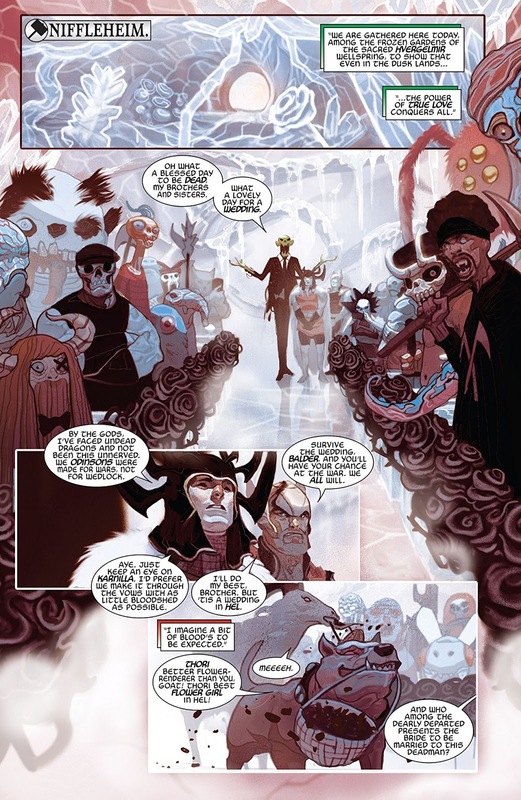 There a few other surprises tucked in at the back of the issue that most fans will find enjoyable alongside me, the first being what Thor asks Loki to do to him, and where it takes Thor. The second surprise is a pretty HUGE cliffhanger with another big guest that I'm really interested to see where it goes. But really that's about it for this issue as a whole, too much explaining what they already showed us the result of, and not enough new stuff ... but maybe I'm just being picky, who knows. Overall, as a whole, this issue continues the trend of this book being a little bit heavy on the exposition, and I think that's because Jason Aaron possibly attempts to make up for the art in spots, which isn't always so clear to interpret what is going on in. The fighting, which only leads to the wedding, went on a bit long after the reveal in the beginning, but by the end, the last few surprises sucked me back into the narrative a bit. I'm still not a huge fan of this stylized art on the Thor title and this would be the weakest of the issues we've gotten so far but it too comes back around by the last cliffhanger a bit. I'm getting used to the look of things a little but I'm hoping when they change realms things might change in the art department. 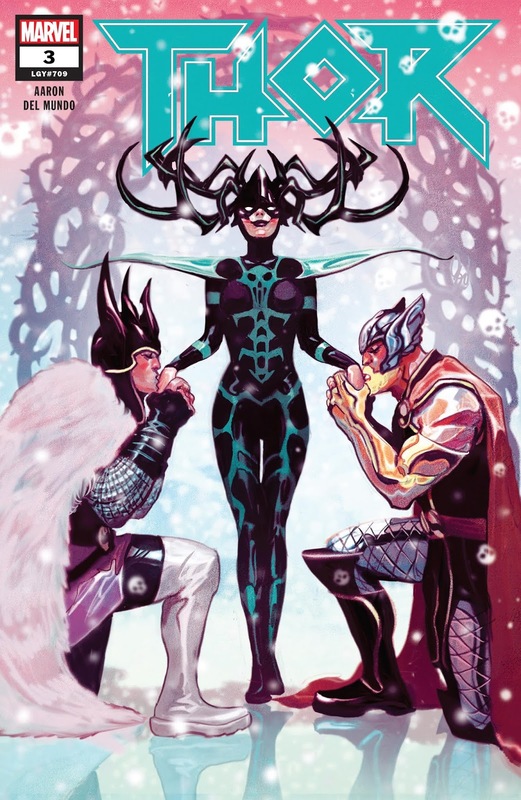 Thor continues to be alright, but unless your a long time follower of the title there isn't much here that is very intriguing for new readers to jump into. There's a lot of characters to juggle in this series so far, and each cliffhanger adds to the madness, so the background is necessary to fully be invested in all the events occurring. Combined with suspect art in spots, and muddy transitions, Thor is still passable but not all that recommendable right now.